Three years ago, on this day in 2013, I put a page online in response to a piece in the Daily Mail, as it had provoked a lot of outrage and angry comment. I was reminded of it because earlier today, in an idle moment, I was looking back through the archives of the pages added to this site since late 2011. An ‘on this day’ marker can be useful, as a birthday or personal anniversary can, for helping us to stop a moment and take stock of changes, and progress. Which is why I thought I’d mention it. 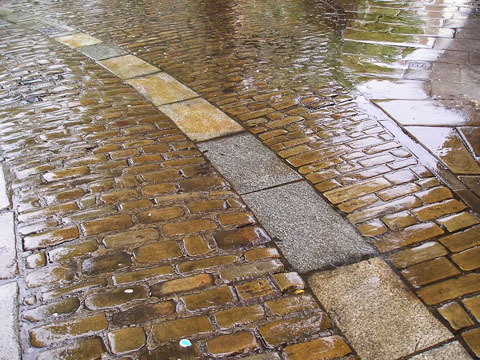 So, a whole three years back, on this day, I published a page about the changes to the paving in King’s Square. I didn’t want to write any more about it at that time, but felt like I had to, in response to the inflammatory Daily Mail reporting of it, and the outraged response to it. The page got a huge amount of attention, a massive number of visitors, and as a website owner I think I’m supposed to be pleased about that, but really I’d rather the council had handled it better and the Daily Mail … well, what can I say. Anyway, it’s three years on since I spent many hours filling in the information that was lacking, trying to present what I knew from a local’s point of view, and being honest about what I wasn’t sure about. A lot has changed in my personal landscape since then, and the landscape of King’s Square has been changed by the addition of expensive paving. The revamp presumably didn’t cost as much as it might have done as they left Paul Woosey’s bench and the mulberry tree and didn’t interfere too much with the raised area. As a result of pressure from people who cared about what was there already. What else, dear readers, has changed in the three years since, here in York? I can think of so much, and so many perspectives on it. But from my perspective the ‘improvements’ to King’s Square were a turning point. Early mentions of it suggested possible investment from local business, Chocolate Story, etc — but it didn’t seem to happen that way. But we, council tax payers I guess, still managed to pay for new paving in King’s Square in 2013, and in 2016, there’s not enough money to do the things we expect our council tax to cover. Though I did recently see one of those drain cleaning machines in my street, cleaning out accumulated silt and leaves from those boring but crucial things that remove rainwater and stop it flooding the streets. I hope you’ve all been lucky enough to have it visit where you live. Apparently, as reported in the Press, it’s going to take another three years to examine all the neglected drains and gullies. Some things seem much better, locally, since 20 Sept 2013. But that’s just my view. Other changes have left me feeling somewhat disorientated. More on that story later perhaps. By Lisa @YorkStories • 20 September 2016 Opinions, thoughts To link to this page's proper location please use the > permalink. « Ryedale House: conversion to residential?